PrimePac Ltd., is the result of two established companies merging. One Stratton Plastics Ltd., Antrim was established in 1990 and engaged in the production and supply of blow moulded plastic containers. The other, Prime Packaging, Newry was formed in 1996 for the supply and distribution of plastic containers, caps and closures. The enlarged company will benefit from the enhanced product range of both companies and the overall commitment to sales and services. Primepac Ltd is in receipt of SFA Capital funding from Invest NI for its investment and growth plans. The project, which is part financed by the Invest for Growth and Jobs Programme 2014-2020 relates to capital equipment which aims to offer a cleaner form of output necessary for the food and pharmaceutical markets targeted and also to improve production output and energy saving to enhance the competitiveness of the business. The company has established a Quality policy statement appropriate to the needs of the organisation and its customers, which includes their commitment to continual improvement and enhancing customer satisfaction. The statement is reviewed for continuing suitability and is communicated, understood and implemented throughout the organisation. Customer impact, potential disruption, and mitigation are addressed at the beginning of any new project. All Employees are aware that they represent the company and accordingly must act in a professional and courteous manner at all times. 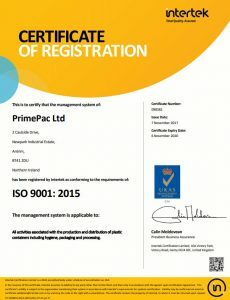 PrimePac will strive to ensure that all work will be undertaken in a high standard to meet the customers’ requirements. PrimePac operate a structured complaints process and pledge to resolve all complaints within an appropriate time frame. 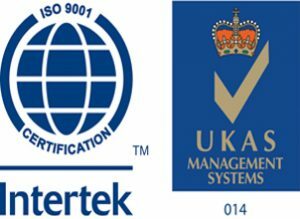 We are committed to the development of long term relationships with our customers and to continuous improvement of our customer care approach through measuring, auditing and reviewing our performance. Customer satisfaction is our objective and we at PrimePac Ltd., will continue to produce products of the highest quality standards and specifications. Prompt and efficient service along with quality control will be maintained by continuous review of performance and attention to detail. Our experienced and motivated work force is committed to work closely with our customers to ensure total satisfaction from design to delivery of finished product. PrimePac Ltd., takes its environmental responsibilities seriously and research into the possible uses of recycled material together with our programme for minimising production waste is on-going.